What is the Keynesian Model? Consumption (C) + Government Spending (G) + Investment (I) + (Exports (X) – Imports (M)). 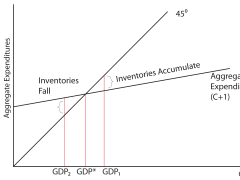 In the Keynesian model, we assume that the economy is closed (which means no there are no imports or exports) and that I and G are constants (numbers that do not change). This is because when disposable income increases, consumer spending will also increase as they now have more money to spend. However, the magnitude of the increase will depend on the MPC. For example, if the MPC is 0.6, when income increases by £100 people will increase their spending by £60. Therefore, consumer spending will increase at a lower rate than income. Notice how we have replaced aggregate demand with aggregate expenditure. Aggregate expenditure is simply the total value of all goods and services which have been bought in the economy. How is this shown graphically? We can represent the idea in a graph, plotting aggregate production (real gross domestic product (GDP)) against aggregate expenditure. As we said earlier, because of MPC, aggregate expenditure will increase at a lower rate than income. We also draw a line with 45 degrees, to indicate all the points in the graph when aggregate expenditure equals aggregate production. The economy will be at equilibrium (Y) when these two lines cross. This is because when the economy is producing above the equilibrium (Y1), there will be an excess supply as there is insufficient demand from consumers. Firms will reduce their supply and produce at the equilibrium again. Similarly, when the economy is producing below the equilibrium (Y2), there will be an excess demand. Firms will increase their supply to match the rise in demand, and increase the production level back to equilibrium. Disposable income – This is the income remaining after all taxes have been paid off. Marginal propensity to consume – It is the proportion of an increase in income that is spent.